D.R Bond Plumbing & Heating are fully qualified Gas Safe registered engineers and we pride ourselves in providing a professional Heating and Plumbing service. We offer our customers professional advice on the best fuel efficient and economic heating systems available within their budget range. By choosing the right boiler and heating controls you will have a central heating system that will be highly energy efficient and very economic. We install Worcester Bosch boilers, which ensures that you benefit from a boiler that is proven for their high quality, reliability and affordable price. 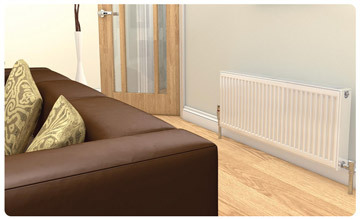 D.R Bond supply and fit radiators from the Stelrad collection, which provide a range of high quality, stylish radiators that will blend in with the interior of your home. We look to install copper pipework as opposed to plastic where possible, as copper is more durable and long lasting. When it comes to central heating installation – whether you’re planning to replace your old heating system or install one from scratch, you can have peace of mind that D.R Bond pride themselves on their quality of workmanship and the quality of the products we supply. ‘Wow hot water on demand! Excellent work, Thanks DR Bond’.